With the superhero franchise comes the weighty expectations from fans on what a superhero movie should be, but with the first of its kind, only more is naturally expected. 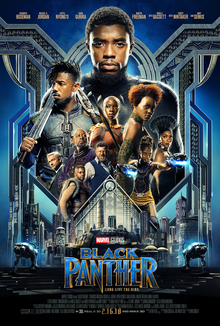 “Black Panther” was released last weekend with a debut of an almost all black cast, and I can say this film certainly holds a place in the top five best superhero movies. It’s no guess why audiences love this film. Not only is “Black Panther” set within the beautifully-crafted, fictitious country of Wakanda, which is known to be hidden in the mountains of Africa, the protagonists of the film reflect what audiences have been waiting to see for decades. Although Chadwick Boseman makes a stunning appearance on the big screen as the Black Panther, audiences can’t help but notice the female leads surrounding him. In fact, the men he comes into contact with all have something to hide or an underlying, darker motive, but not the women in his circle. In truth, his mother, his sister, his general and his lover are all who push Blank Panther to be the hero he is. Lupita Nyong’o, Danai Gurira and Florence Kasumba bring to life the strong and empowering female leads crucial to the minds of the little girls watching, especially to the girls of color. These outstanding characters lack in nothing and have only the dedicated love, loyalty and incredible skill to aid the Black Panther in fighting injustice. And just for fun, since every white movie has one black actor, Martin Freeman plays the one good, white guy as an unlikely supporting role to the fierce Wakandan warriors. Aside from the characters and the action-packed plot, the underlying themes in the film reveal the reality of the racial tensions and ties the black community faces. Michael B. Jordan plays antagonist Erik Killmonger to the Black Panther. On a quest to fight against global scale oppression of the black community, Erik faces against the Blank Panther to take the throne of Wakanda in order to provide the oppressed with Wakanda’s super-powered weapons and begin several civil wars across the world. Though Erik’s the evil villain in the story and his means don’t match the desired result, Erik’s truths strike a cord in the audience. Quite frankly, he has a good reason to fight, and the Black Panther realizes this too. Erik’s anger and rage is real; his motives are real. Not only does “Black Panther” address the strength and wit of black men and women, but now audiences are hit with the pang of reality. With the ever-growing need of representation in media, “Black Panther” is the film to finally display the black excellence generations of movie-watchers have craved since the early 1900s. It’s no secret that Hollywood under-represents minorities of every race, ethnicity, gender and sexuality, but at least now we can hope to see more films like “Black Panther.” Cheers to equality.